Happy Spring!! It's always nice to have you visit! There is so much going on in the world that brings us down and makes us sad. That's why it's wonderful to have this community of artists which allows us to escape from all that for a bit of time every day. I believe every card we make and send helps counteract the darkness, so it's important that we carry on doing our little bit to spread joy and kindness! In particular, this week I was on CAS Island preparing to play in some of the many fun challenges out there. I got so mojo-juiced I not only made a Twofer, I made a mirror Threefer, so let's get started. Here we have a card with a base embossed using a NBUS holly e/f from Park Lane. The front panel is a photo frame die from PTI. In the photo opening is a background I made by sponging Oxies in Christmas-y reds and greens. 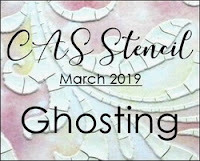 Using a NBUS Holly stencil from Echo Park, I created the ghosted holly pattern following Lolly's video instructions on the CAS Stencil blog. The sweet deer silhouette is a die from SSS and the sediment is from GKW. I just love that sweet deer. To me he looks like he's thinking, "Mmm. Is that freshly planted flowers I smell?" He doesn't know they are just for looking at. Plus he gets confused when he sees people eating them in restaurants, but he gets in trouble when he does it. Christmas Kickstart: Moves on hooves. This card features watercoloring on vellum. I'm guessing the mum and sediment are both from Penny Black. 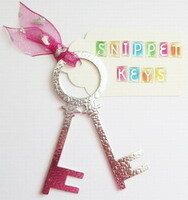 They were first heat-embossed in platinum. The jewel-tone watercolors were DI inks applied with a barely damp waterbrush. I painted the back of the vellum first, but it wasn't bold enough for the look I wanted so I turned it over and also painted the front. Maybe the vibrancy depends on the opacity of the vellum used. I'm very tickled that I can cross "use opacity in a sentence" off my bucket list. The vellum sheet was attached to the card base with two old-timey brads. I'm very tickled I kept a few of those. It doesn't take a lot to very tickle me. CAS Watercolour Card Challenge: Watercolour on vellum. 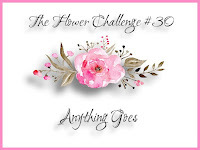 The Flower Challenge: Anything goes. Words 2 Craft By: "Happiness held is the seed. Happiness shared is the flower." This was a Ripley's Believe It or Not situation. The NBUS cone flower stamp and die from Joy! Crafts has been on and off my desk "in line for use" at least a half dozen times over the last six months. Apparently the universe knew they were sposed to wait for the current challenge at Sunday Stamps! You can see the sketch below. Spooky, right?! I've played in hunnerts of challenges over the years, but I don't think that's ever happened to me before! 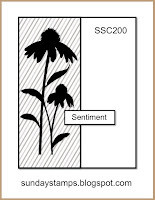 In addition to the cone flowers, I used a striped e/f for the white side and a tiny Hello label maker sediment from SSS. The funny thing is, when I purchased these two cone flower items, I assumed the stamp and die were the same size, but when they came, I discovered the die is about a half inch smaller. That was a dilemnation for me and I stared at them with my head cocked. From the top shelf behind me, I could feel Hammy rolling his eyes. "Make two cards, _______," he said drolly, using an endearment he calls me when I'm being especially kanuckle-headed. Sunday Stamps: Sketch. Congratulations on your 200th challenge! That's fantastic! Don't forget you've got a coupla more days to play with your balloons and enter Twofer! Please don't be deterred by the clever unconventional entries we've had. You can always use your balloons (and I know you've got 'em) in traditional ways! I'd love to see what you can do! These are all so wonderful Darnell! I especially love the black and white bold flower numbers, and yes I hear you with the 'size' matchy thing, I've had that happen too, and I think Hammy said the same thing that my Hubby would say lol. Hi Darnell, Loving the cards, but the second one is just stunning. Have a great first day of spring! A fourfer, whatever next? And all of them stunning. I think I'd feel a bit cheated if i bought a stamp and die that didn't match. 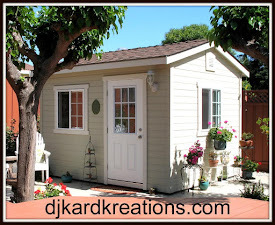 It's always a pleasure to visit here and see your beautiful creations, not to mention reading your posts! You are so right about this community brightening up an otherwise dark world... I love your cards and that is so spooky how accurate your last 2 cards are to the sketch... Spooky but beautiful though! Wow you have been a busy lady. I love all your cards and the techniques you used on each one. The deer is so cute. 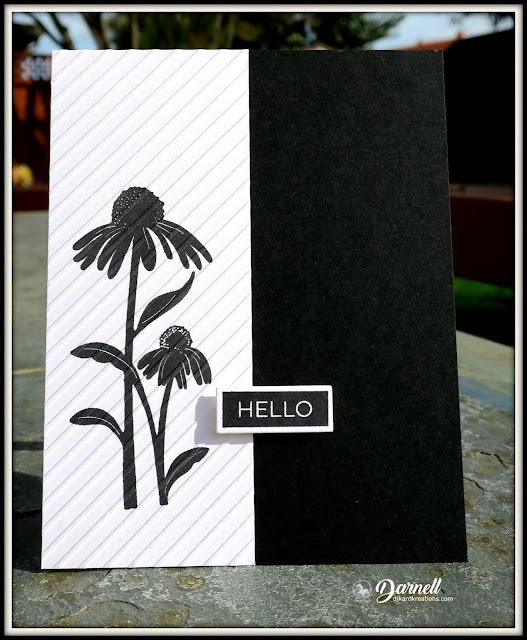 The vellum flower is stunning and the two cards with the cone flowers in black and white are amazing. Thanks for sharing and have a wonderful day. Your first card is so sweet! But favorite here is your 2nd; great the gold and colours! And the mirrored cards show you can do so much with this hobby of ours! So awesome! you are the Embossing Queen for the day, D! and just when did you start modeling? 'cuz that mirrored duo is perfectly vogue-a-licious! Do you think the Sunday Stampers could have a spy that saw that stamp on your desk? Beautiful cone flowers. I wish I had a mirror that could make me look smaller! Your vellum flower is GORGEOUS! I love the platinum embossing and gorgeous colors! Every once in a while those brads come in handy. Your deer is adorable and he does look like he's been wondering why he can't eat that foliage. I love how the embossing mimics the ghosting. All are wonderful CAS cards!! All of these cards are stunning! I'm glad I don't have to choose a favorite. Thanks for your tips on how I might CASE them. You're so delightful. Enjoy your day. Those black and white cards are striking!!! Spring started with about a half inch of snow yesterday! Not what I wanted! Have a good day! Wow! Yo've out done yourself this time. These are all beautiful. I love b/w images. The background on the Christmas card is beautiful. My favorite is the flower on vellum. How do you get your vellum to lay flat after heat embossing? I must over heat mine. It is always curling on the edges. Hi Darnell, love, beautiful and WOWzer x 2! I love the striking contrast in a black /white card. And these two really knock your socks off! Hope you’re enjoying some spring weather out there. We had spring the last half of February and the first part of March then ol’ Man winter came back for a week. Now having spring for a bit before we start early summer temps. I love the hot temps even if I can’t be out in them much anymore. Have a wonderful rest of the week. Furry hugs from the Girls. Just a regular hug from me. All the cards you made are fantastic! I love the wonderful Christmas design. And, the gold embossed floral is beautiful! And, how you managed to get the sketch design so perfect is beyond me. It looks exactly like it and with that design you got two more beautiful cards. Great work my friend! What a fabulous post and super cards. Your deer is darling and that ghosted background is sublime. I like that you colored both sides of your vellum. I agree that the opacity probably plays a big role in color come through. I'm not sure I would have thought to add color on the front side too. But now I am armed for when I tackle that challenge. I am so in love with your black and white cards. Stunning impacts. So in love with them and that tiny hello. Have a great day my friend. Well, this visit was purely delightful...a Threefer...I love bonuses. And how many challenges your completed in one post...goodness, this must be a record. That deer is really a...well...dear. Your Twofer is just gorgeous...WOW! Lastly, those coneflowers, so lovely and so like the inspiration. (Personally, I think you planned it.) Also, I can just imagine your consternation when you realized the stamp and die didn't match. So fun - your black and white blossoms are the perfect rendition of our sketch - so cool! Love the crisp look of your choices - so buttoned up! Thanks so much for playing at Sunday Stamps! wonderful set of cards. And glad you got lots of mojo. And have to agree this little community is an escape and a little happiness for us all. Even when no mojo like me at the moment....just visiting and seeing the joy of other cards brings a smile to our face. Indeed you have been busy! My favorite is the colorful mum and you used brads! Also just love the black and whites...always stunning together and your cards are super. Am saving this post for inspiration. Thanks!! Beautiful ghosted snowflake background on your sweet Christmas card. Lovely embossed background and cute reindeer. Thank you for sharing at CAS Stencil. What gorgeous cards Darnell, the most beautiful of designs, I especially love the floral image on vellum, it's stunning. Oh wow Darnell, so much beauty here today! You really do make the most gorgeous cards. The little deer on the first one is adorable! The flower image on the vellum is stunning, you have painted it beautifully, it still has a wonder delicacy about it. Now that was a great read...chuckled and inspired all in one...way to go x.Great ghosting effect on your first card and do so love that cute deer and yep he really cannot understand why he can't eat the flowers! Such a beautiful card with the delicate painting on the the vellum....great you held onto those brads x. A really brilliant collection of cards, each so special in their own way but the black and white cards look so stunning both ways. WOW...you have been a busy beaver my friend!! Your deer card with the ghosted background is wonderful...LOVE that sweet image, even if it really does look like he's looking for some flowers to eat! Your 2nd card is FABULOUS Darnell!! Love how you water colored on both sides of the vellum to get those rich and vibrant jewel tones! And yay to you for using the word opacity in a sentence...you've definitely surpassed me there!! And your mirrored cards are STUNNING on top of being extra cool to match along with the inspiration photo!! 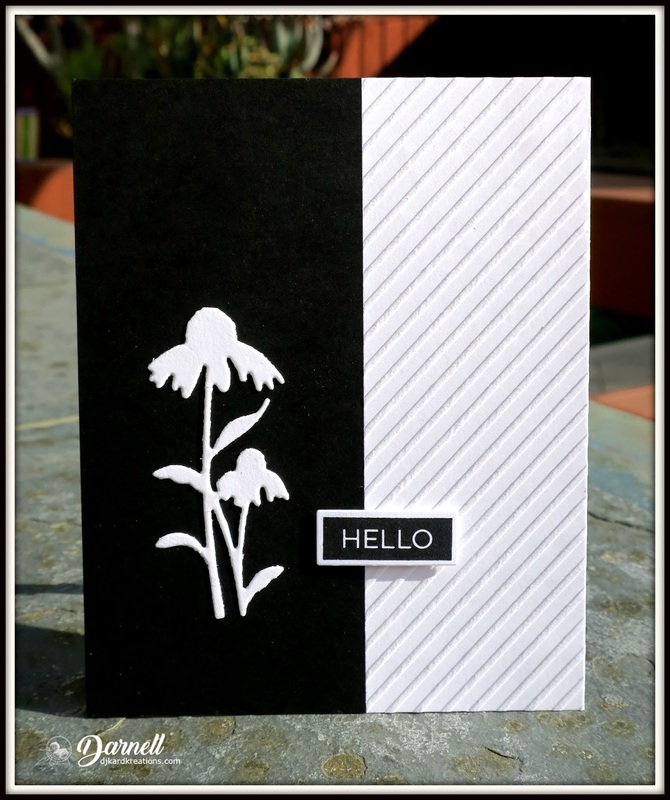 I've always loved black & white cards and your silhouetted cone flowers are AMAZING!! Well done on spreading joy today my friend!! Hugs. :0) Oh, and thanks for playing along with us at CAS Watercolour!! A trio of loveliness Darnell! I like the fresh clean look they all have! Oh my gosh, what a feast for the eyes, Darnell! Your ghosted background is perfect for your darling deer and I LOVE how you watercolored the mum....two fabulous cards! I also love how you created the mirrored cards...black and white is so striking and I love how you added texture to your design with the striped embossing...so cool! A stunning compilations of card, Darnell!!! All so beautiful, and I just LOVE the second one stamped on vellum, WOW!! 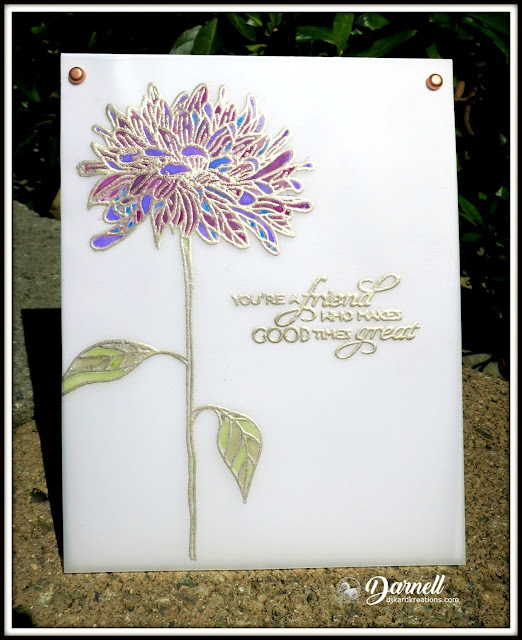 The flower is really vibrant and the platinum embossing looks amazing on your CAS! Gorgeous collection of cards (as always)! I absolutely love that gold embossed and multi-colored floral card...it's my fave of the collection. Thank you for joining us at W2CB! Darnell wow what a fourfer. your black and white classics are amazing and that adorable little deer certainly looks thoughtful looking back into the distance :) Well done with the ghosting, I'm having a little trouble with that one. Thanks for joining us at CAS Christmas. I'd say you and Mr. Mojo have been pretty darn tight over the last few days. Does the mister realize you're seeing someone else? I don't mean to be a buttinsky, but this mojo fella' is having quite an affect on you--and the results are pretty magnificent. Just tread carefully, my friend, and don't let him take over your life. Well, you've certainly been busy! Two cards for the CAS challenges in one day! 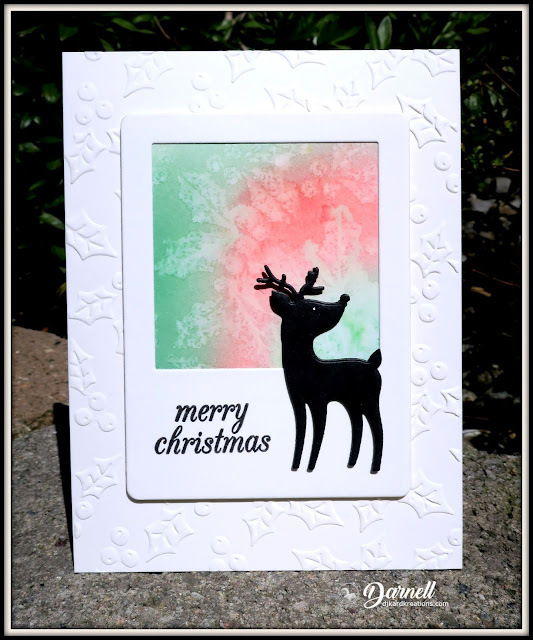 Have to say I love that sweet little reindeer with the festive colours behind him and the lovely embossed holly behind that - a wonderful card for my reindeer challenge over at CAS Christmas! And what can I say about the gorgeousness of the CAS Watercolour card? LOVE those colours inside the platinum embossing. Great idea to paint it from both sides. Thanks so much for joining us at CAS Christmas and CAS Watercolour! p.s. Also love the elegance of your two black and white cards! Yay for old-timey brads!!! And how bizarre that your stamp exactly matches the sketch! Gotta love having a personal sketch for your card : ) They all turned out wonderfully, Darnell. Beautiful display Darnell, I especially love the watercolour on vellum, a beautiful technique and one I do for special cards never ones that people request, we have to keep a little of something just for ourselves. Your so right about the world and it's wickedness within it. Thank goodness for creative friends who can help us take our mind of it all, if only for a moment. Thank you for sharing & spreading the crafty love. Gorgeous cards ..... love the cute little deer. Thank you for playing along with the CAS Stencil challenge. That is a great background for the deer, along with the holly embossing. The ghosting really shows up and is so pretty. I love your watercoloring on the vellum card. The colors really look mummy. I wish brads would make a comeback as I have so many. A perfect way to attach the vellum. Mine leaked. I wonder why the die wasn't the same size as the flower. Nevertheless, the black and white are beautiful and a wonderful use of both. There are so many wonderful things to look at that it's hard to make compliments without it being a foot long in the comment section, Darnell. I see Serena Dipity visited with her coneflowers and they look fantastic in bold black and white. I love that holly embossing folder and your deer is a cutie. Gold embossing the mum really makes it shine and the colors are wonderful. Thanks for sharing that one with us at The Flower Challenge. Great cards, Darnell! I do believe I am seeing the exact sketch challenge only doubled! I do like the richness of the black and white. 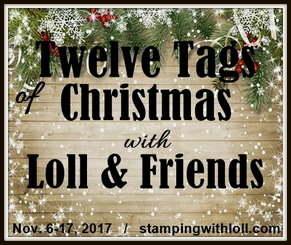 Thank you so much for joining our 200th challenge at Sunday Stamps! Three amazing cards, Darnell! That little deer is a dear with his little nose in the air to smell the flowers. How in the world did you get red and green to play so nicely together in your blending?! Such a gorgeous mum with vibrant colors in that beautiful platinum! I absolutely love that your cone flowers knew to wait for just the right moment to decide to play. I would be confused about the stamp and die ratio too. Hammy's droll...hmm, his voice just isn't what I expected it would sound like. hahahaha! Gosh, you had yourself a good ol' time, didn't you? Good progress on the NBUS and a bunch of really nice cards you can spread happiness with. Here, here on that idea! Pretty eerie about the coneflower. Its time had come. I actually made 3 cards yesterday and they're not even CAS. Well, maybe one sorta is. Surprised myself. We do have fun, don't we? Hi Darnell! Happy Spring! So glad you made time to block out the world and get crafty. All four of these are lovely, and I'm thrilled that you shared that vellum beauty with us at W2CB. 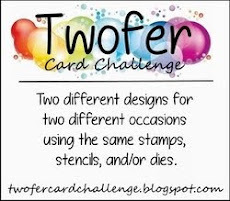 Thanks so much for playing along with our happiness challenge at Words 2 Craft By. And, please accept my apologies for not playing at Two-fer these past few months. I'm on the island and seriously do not have any stars or balloons with me. Lots of bunnies, lots of flowers, and lots of dad things. LOL Maybe next month! Oh Dolly! I LOVE that soft background of red and green behind your adorable deer! The ghosting gives it a dreamy, peaceful look ... so very pretty. Thanks for sharing this with us at CAS Stencil. 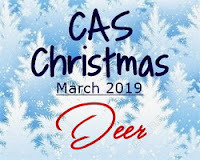 Your deer would also work for CAS Christmas if you'd like to join us there! Love your vellum watercolouring. Gorgeous embossed bloom with vibrant colours. A very beautiful and elegant card. 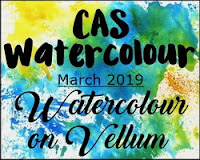 Thanks for sharing with us at CAS Watercolour. your both card are clever stunning and LOVE the same flower stamp and DIES..
It’s always a pleasure to visit your blog Darnell and I always leave with a smile! Love all your cards especially the black and white threefer! Thanks so much for joining us at Less is More. Each card is so unique and beautiful! The deer card is so pretty and sweet. Love the colorful background. Gorgeous flower card with the embossing. And, last two mirror cards are elegant and so perfect! Take care and have a wonderful weekend! Lots of inspiration in this post, Darnell! Clearly your cone flowers were meant for that challenge--amazing! I adore the sweet deer card & your painting on vellum is gorgeous! What a fun collection of cards, your cone flowers are very elegant, and your Christmas card with the ghosting is stunning! Have a wonderful week! Darling deer card, Darnell - love the background!! Beautiful flower cards too, especially love the black cone flower! Glad it finally got a trip from NBUS-land!! This was more like a four-fer?! You ended up with four beautiful cards! The ghosting along with that deer and the embossed flower--so so pretty! awesome cards as always...love the flower stamped onto the vellum, so elegant and pretty. Thanks so much for playing along with the CAS Watercolour Challenge! Darnell I can never get over how many comments you get on your cards, it must give you so much reading pleasure. I love the collection of cards you have done. Have to mention that first one for Christmas what a wonderful background to the deer, looks just perfect. Love all the cards with different techniques. I am your newest follower. wow your work on the vellum is just exquisite. Love those transposed black and white cards too. Sorry I didn't get around to the balloons -mojo went awol! Hi Darnell, always a treat to visit your blog! I absolutely adore your take on our challenge. The black and white color scheme looks very stylish and elegant and the style of the flowers adds softness to your design too... Wonderful work! Thanks for joining us at Less Is More!